Although all juices are cleansers and detoxifiers to some extent, this Super Detoxifier juice is an exceptionally great detoxifier. It contains ingredients that by themselves have great cleansing capabilities and put together in this juice have the ability to do a super cleansing. 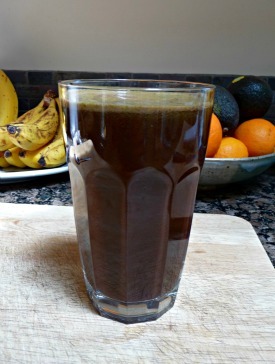 This is a really dark earthy juice, but fairly palatable because of the carrots, lemon, and ginger. Still not for the faint of heart, after all it is a Super Detoxifier. Makes about 28 oz. of fresh juice. Warning: if you’re new to cleansing either start with another recipe, or cut this with water by 50% before you drink it. This juice can really clean you out in a big way if you’re not used to consuming some of the ingredients in this juice, mainly the cabbage and beets. But please don’t let this caveat you keep from trying this powerful cleansing and healing juice. I think that’s an important point to expand on. Many times we think of these cleansing juice recipes as doing just that, cleansing, but they are also strong builders. They provide copious amounts of amazing nutrients to help build strong healthy bodies from the inside out. 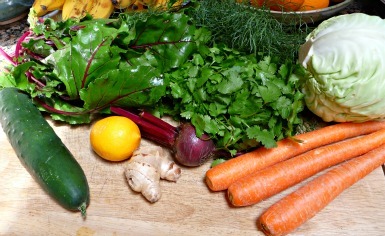 These juices will certainly cleanse and provide nutritional support for the healthiest of bodies. The body is continually replacing old cells with new ones. The trick to staying healthy and as youthful as possible is to ensure that the replacement cells are strong and healthy, and functioning as nature intended. When we cleanse with juices or any effective method for that matter, we are allowing the cells to function at their highest capability and increasing the odds that the cells will be replaced by equally healthy cells and not by degraded cells from damaged DNA. As you can see juicing is far more than running some produce through a juicing machine and drinking it. The long term health implications and benefits from a regular juicing regime are phenomenal. The key is to continue juicing on some type of regular schedule, even if it’s only on the weekends. And you may find a nice organic juice bar in your neighborhood or near your work that will allow you to enjoy the great benefits of fresh juice while maintaining your full schedule. Thanks for the tip about juicing on the weekends. That fits my lifestyle. I could also juice in the evenings. Hi, I'm wanting to detox and don't really know where to start! Would I just drink this juice and have nothing else or would I also eat? Thanks. ******You could drink this juice for one meal and then eat salads or fruit for the other meals. Or you could drink nothing but juices and water for a day or two. It depends on how toxic you are and how fast you want to go. Check out the webpages on weight loss and detoxing for more in depth information. This one was a little harsh to start with, but got the job done. have been drinking it twice a day for a week now (sometimes with a slight variation) and I feel cleaned out and full of energy. Will continue on with it until I feel like a change. Recommend this juice to seasoned juicers. I think I'm really toxic and wants results. Before i knew that there are juice detoxifier I've tried tried taking green juices in packs but got no good results. I think I really need to remove all the toxins in me to feel really good and I need a good recommendation. I'm 59, 5' and my weight of 70 kilos bothers me a lot and lowers my self-confidence. I know I need help. Thanks. This list of books and supportive health products may be of help also. Choose one item from each step to start as needed. Cut and paste into browser if need be. STEP 1 for you is Cleanse the Colon. Get cleaned out and keep things moving. These two you would want to also do the Liver cleanse as outlined in the Book by Andreas Moritz in the first email I sent you. STEP 3 (if needed) depending on results from above cleanses. Combine this regime with healthy eating as we discussed for long term life changing health.